“Embraer Botucatu appreciates the efficient work provided by ICAM Technologies to develop automatic programming of our Torres-Tool Universal Holding Fixture (UHF) fitted on our M-Torres 5-axis milling machine. ICAM’s UHF solution, integrated with our CATIA CAD/CAM system, allowed us to efficiently program different skin panels and rapidly program the Torres-Tool system. ICAM’s post-processing and machine simulation also provided us with optimized NC code that allowed us to take full advantage of our Torres-Tool UHF system. “During my NC post-processor research and evaluation, I discovered ICAM Technologies – a famous post-processor development company with a great reputation. I immediately contacted a person from ICAM China who was enthusiastic and really helped me resolve a number of technical problems we had while linking our CAM system to our CNC machines. It is always possible to handle these complex matrix coordinate changes by creating a C-program to initiate the functions we want to address on the machine, but we are not as proficient as ICAM when it comes to writing post-processors or post-processor generators. Using ICAM’s post-processor development software, we didn’t have to work hard to deal with the basic problems related to 5-axis post-processor creation. We just had to answer the questions from the ICAM questionnaire in accordance to our machine requirements. Using ICAM’s post-processing software is easy to use and more importantly, the generated code is very safe. I can say that it was a wise decision to choose and purchase the ICAM software. With ICAM’s post-processor generator, we have been able to implement automatic cartesian/polar coordinate machining using our Haas machine and we have also implemented special machining strategies to use oblique machining with our DMG machine. ICAM’s software solution helped us maximize the use of our machine tools, shorten processing time and improve the accuracy and surface quality of our finished parts. Valley Machine Shop Inc., located in Kent, Washington, manufactures small to large aerospace details and assemblies and specializes in CNC Milling and Turning. Valley uses mainly Mastercam, employs 60 people and operates twenty 3-5 Axis Mill & Lathe CNC machines. “Prior to using ICAM, getting a post-processor running behind Mastercam for a new machine was a very slow and frustrating process. Many times we started with a very generic post and had to resolve its issues in the production environment. On the contrary, ICAM started collecting information about our machines the first time we called them. They knew the correct questions to ask and the result was a nearly working post when the machine hit the floor. ICAM software, a link between Engineering & CNC machine code. “Triumph Aerostructures – Vought Aircraft Division, a subsidiary of Triumph Group, Inc., is a leading global manufacturer of aerostructures for commercial, military and business jet aircraft. The company has full fabrication capabilities and available products include fuselages, wings, empennages, nacelles and helicopter cabins. The company’s customer base consists of the world’s leading aerospace OEMs. Triumph Aerostructures – Vought Aircraft Division employs about 6,000 people in six U.S. locations. One of the company sites, located in Nashville, TN, produces individual parts and sub assemblies for Airbus, Gulfstream, Cessna, and Lockheed Martin. With approximately 900 employees spread over two million square feet of work space, the Nashville site has 10 large CNC gantry mills, nine large assembly riveters, and a variety of smaller CNC equipment. In the machining area, there are more than 35 CNC spindles making chips. “The Nashville facility focuses on parts that are ‘long and large.’ Most everything we do is longer than 30feet,” said Lead CNC Programmer Bill Gwinn. Those ‘long and large’ parts start out as massive engineering models, many of which reside in legacy CATIA-V4 CAD/CAM data files. Using ICAM’s Post-Processing software, Triumph has been able to convert CAD/CAM engineering data files into Computer Numerical Control (CNC) code, quickly and virtually error free. As of 2007, many parts are being developed, or imported through a newer CATIA-V5 system. Using a two step process, CNC programmers can extract the graphic engineering data (from either system) into APTSOURCE (APT) files, which are then fed into the ICAM Post-Processing software. ICAM converts the APT information into customizable code for each CNC machine. Since 2007, three new Post-Processors have been developed for three different CNC machines. The first two are for Handtmann 5-axis mills; one with a single head configuration, and the second having a twin-head gantry setup. The most recent Post was developed for an older Cincinnati 5-axis Gantry mill that was ‘retrofit’ with a new Siemens 840D Control, the same control used on both Handtmann mills. After processing the APT files through ICAM, the final output (CNC code) instructs the CNC machines to mill Aluminum billets into precision aircraft components. Typically, these large complex parts have machine times measured in days, rather than hours & minutes; and that’s with three shifts of machining. Parts this big require large programs; in many cases, multiple large programs. According to Gwinn, that’s where ICAM has paid for itself. The processing time for these programs takes about half the time as the old Post-Processor. While ICAM has proved itself as a valuable tool, Gwinn says that his time training at ICAM was “invaluable.” The two training sessions spent helped us go beyond just using ICAM. Triumph also has an ICAM developer’s license, and used it to build the first two Posts. This also allows users the flexibility to modify any post as needed. “Precise Machining and Manufacturing specializes in manufacturing complex aerospace structures and assemblies. Our programming department utilizes Catia, NX, and Esprit to create complex 3-5 axis programs for a large variety of machine tools. CAM-POST software from ICAM easily enables us to generate the specific output for each machine tool we have. ICAM’s trainer gave us a post building training session that was tailor made for our needs. There were no questions he couldn’t answer, or complex posting problems he could not easily solve. Since then the ICAM support team has given us very timely support whenever we have needed it. “Meyn Food Processing Technology B.V. develops, manufactures sells and supports machinery for Poultry processing and is one of the global leaders in its specific market. The company is headquartered in The Netherlands, has Sales Offices in 13 countries worldwide and manufactures its products in four locations in Europe and the USA. Meyn manufactures most of its components in-house, for which it has an NC infrastructure in its Oostzaan location that consists of eight different multi-axis CNC machines with outsourced post-processor development. The main 3D CAD system is CATIA V5 from Dassault Systèmes which is managed by Enovia Smarteam V5. CATIA is used for concept design, detail design and CAM programming of the newly developed machines. CATIA 3D CAD is used worldwide, while CAM programming is only done in the main location in Oostzaan, The Netherlands. During 2010 it was decided that Meyn no longer wanted to be dependent on external post-processor developers and wanted to do these developments in-house, based on state-of the art post-processor development software. For this, CAM-POST from ICAM was selected after presentations from, discussions with and a proof of concept by two different software vendors. The implementation of CAM-POST started mid-2010 and currently (May 2011) has resulted in the re-definition or new development of all required CATIA post-processors but one: the Zayer 5-axis machine is still under development. Corporativo Nemak S.A. de C.V.
ICAM’s CAM-POST NC post-processing development software allowed us to move away from using only 3-axis mills and allowed us to take maximum advantage of modern 5-axis milling machines. This enabled us to minimize the need to re-position our parts, improve our productivity and ultimately lower costs. Additionally, my ICAM sales and support contacts are always there to respond to my requests for information in a timely and efficient manner. C.E. Machine Company, Inc. is a one-stop source for all machining, assembly, and kitting needs. Located in the heart of the Air Capital of the World, C.E. Machine has called Wichita, Kansas home for more than 40 years and is located just east of Wichita’s Dwight D. Eisenhower National Airport. C.E. Machine has a total of 25+ CNC Machines with three palletized systems totaling 161 available pallets. AS9100 Certified. CNC Lathes, Grinders and 3, 4, 5 Axis CNC Equipment. ICAM has provided C.E . Machine with a comprehensive solution for post-processing and verification through their CAM-POST and integrated Virtual Machine software for both MasterCam and CATIA. Before we purchased ICAM, programmers at C.E. Machine had to generate NCI through the CAM software, use a third party post-processing software to post, and then import all part, stock, and tool models into a separate verification software before programs could be sent to the shop floor. With the solution ICAM has provided, programmers now use a single software suite to do all of the above simultaneously. This saves time and removes the potential for error when moving data between the different software. The ICAM Virtual Machine verification software has also proven to be more user friendly, intuitive, and customizable than the verification software we used previously. 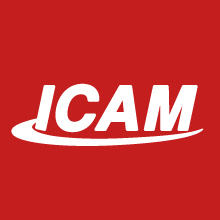 ICAM has become a trusted partner who has always been available with immediate support as we have developed our post processors and virtual machines to get the most out of our machine tools.